It's once again been another interesting 24 hours or so in the world of tech, with a lot of rumours around, covering Amazon, Apple and Microsoft. We also saw a drone world record get broken, as well explain here, courtesy of the reporting from our friends at TechRadar. The general consensus is that Apple is working on a pair of virtual reality or augmented reality glasses of some description, and a newly published patent gives us some idea of what they might look like. They're going to be designed to be very lightweight and comfortable to wear, the patent filed by the company says, using a specially developed system of multiple lenses to beam computer graphics right into your line of vision. Have you been watching the Winter Olympics at all? 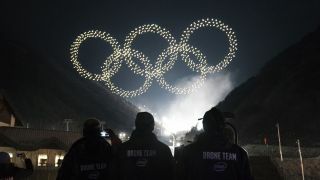 Thanks to a pre-recorded segment shown during the opening ceremony, Intel now holds the record for the most drones flown simultaneously – 1,218 of them in fact, choreographed to show the same of the Olympic rings as well as various other sky pictures. That smashes the previous record of 500, which was also held by Intel and its fleet of intelligent, compact, swarming Shooting Star drones. If you're a Windows 10 user you might soon get the chance to test out early advanced versions of some of Microsoft's apps ahead of time. Eagle-eyed tech journalists have spotted a special preview program in the pipeline, which works separately from the Windows Insider program – another beta testing scheme. As yet, it just seems to be an idea Microsoft is testing, with no word yet on when it will go live or how it will actually work. There's money in Bitcoin – apparently – so it's no surprise that cyber criminals have taken an interest in mining the cryptocurrency. According to security researcher Scott Helme, thousands of government sites across multiple countries have been hijacked, forcing the computers of anyone who visits them to start working on a Bitcoin mining task. No user data has been compromised though, and it looks like the bug has now been patched up.